After nearly three years of grappling with contaminated drinking water, the citizens of Flint, Michigan finally obtained some relief as a federal court approved a settlement mandating replacement of lead pipes. As we mark Public Health Week in New York, we must confront the sobering need to “get the lead out” here as well. Lead is a potent neurotoxin. It is particularly damaging to children, who absorb as much as 90 percent more lead into their bodies than adults. Once ingested, lead flows from the blood to the brain, kidneys, and bones. Children’s organs and bones are immature and more vulnerable than adults’; they also have an incomplete blood-brain barrier. We have known for some time that high levels of lead can cause severe health impacts – including anemia, kidney disease, abnormal brain function and even death. Yet the medical science now confirms that even low levels of lead can cause permanent damage to our children. Over the past two years, the tragedy of Flint has stunned the nation -- we watched the drinking water of an entire city become contaminated with lead. Now we know this toxic threat extends well beyond Flint - to communities right here in New York. In fact, test results show that lead is even contaminating drinking water in schools and pre-schools, flowing from thousands of fountains and faucets where our kids drink water every day. As more schools test their water in New York, they are finding lead. In the latest round of testing in New York City, reports show nine times as many water sources tested above the EPA’s “action level” of 15 parts per billion (ppb) compared to tests conducted just a year ago. Such confirmed cases of lead-laced water are likely just the tip of the iceberg. Often, we only hear about “elevated” results – i.e., those showing more than 15 ppb of lead in the water. However, there is no safe level of lead. Moreover, even properly done testing often fails to detect lead in water. Mark Edwards, the Virginia Tech expert who helped Flint residents uncover their tragedy, has even compared lead testing to Russian Roulette. 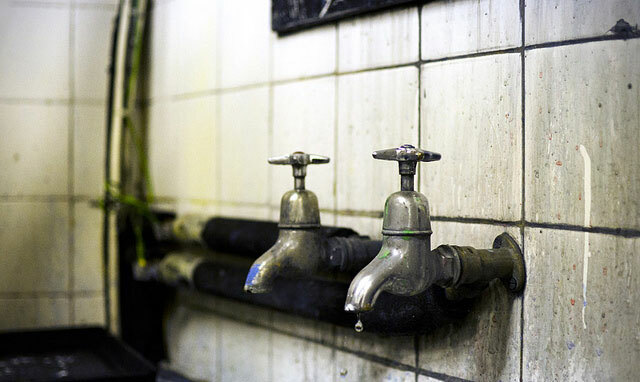 The reason for this pervasive problem is simple: all too often, the water delivery systems in our homes and schools are lined with lead – from the pipes to the plumbing and fixtures. In some cases, the service line, which brings water from the main pipe in the street into a home or school – is entirely made of lead. So instead of waiting for more tests to confirm this toxin at the tap, we should take a more preventative approach, one that truly prioritizes children's health and safety. The common-sense solution is to remove lead from pipes, plumbing, and fixtures. And until we’re sure that’s 100 percent done, we can protect our children with filters certified to remove lead, at every tap used for drinking or cooking. To be sure, undoing this toxic legacy throughout all of our communities will take time. But the first place for us to start is with our schools and daycares, and the other places where our children go each day to learn and play. Fortunately, Governor Andrew Cuomo and the New York State Legislature have finalized a $2.5 billion Clean Water Infrastructure Act as part of the budget for the new fiscal year. This is a huge boost to efforts to protect drinking water at its source. However, in February, state Comptroller Tom DiNapoli released a report that places the state's drinking water infrastructure needs at $40 billion over the next 20 years. Such high estimates make it clear that steady and consistent future funding will be required as well. As our nation rushed through more than a century of unprecedented economic growth, we allowed toxic health threats like lead to become embedded into the fabric our lives. We allowed manufacturers to put this potent neurotoxin in our paint, gasoline, and many other products. For decades, public health officials have been working to undo the damage. Banning lead in gasoline immediately removed a major source of toxic air pollution. Barring lead in paint stopped a major threat to children’s health from becoming even worse, but we are still cleaning up the damage from millions of homes with lead paint, as well as related lead in dust and soil. Yet until Flint, few of us were thinking about lead in the pipes and plumbing that bring drinking water right to our faucets. Now we know, and now we must act. For the sake of our children’s health, it’s time to get the lead out here in New York. Heather Leibowitz, Esq. is the Director of Environment New York, a statewide advocacy organization. On Twitter @EnvNY. New York State is facing a drinking water crisis and we cannot waste another moment in aggressively and adequately addressing it. Close to home for me, recent reports that the Environmental Protection Agency discovered a dangerous chemical — 1,4-Dioxane — that is more prevalent in our drinking water here on Long Island than anywhere else in our state raise serious questions about our health and safety that must be immediately addressed. Dioxane is a hazardous agent often used as a stabilizer for manufacturing solvents, and is present in many shampoos, lotions and detergents. Worse, it readily leaches from soil to groundwater, is resistant to biodegradation, and cannot be removed from water with conventional treatment technologies. An EPA report concluded that this toxin is “likely to be carcinogenic to humans" by all routes of exposure. Whether it is Dioxane, other chemicals, lead, or bad infrastructure, all over the state we have water quality problems that require our immediate attention. The time to act is now. All public institutions put in place to protect New Yorkers must marshal their resources to ensure we quickly learn the extent of this problem, create a plan to address it, and act swiftly to clean our drinking water however necessary, wherever necessary. Pass legislation I put forth to direct the state’s health commissioner to immediately conduct a comprehensive health review of 1,4-Dioxane in our water and set a specific limit for this dangerous chemical. Currently, there is no specific standard for the amount of 1,4-Dioxane allowed in our water, which means it automatically defaults to a catch-all standard, which is way too high. Develop technology to remove 1,4-Dioxane from our water. There is a pilot program underway in Suffolk County to do just that, which must be expedited and expanded. Approve Gov. Andrew Cuomo’s proposal to invest $2 billion in critical clean water infrastructure across New York. Water treatment can cost nearly $1 million to rid each contaminated site of 1,4-Dioxane -- a bill local municipalities simply cannot afford to foot. The new funding stream would go a long way toward supporting the chemical-removing technology that we need. Water is our most critical natural resource, and Long Island relies heavily on its aquifer system to provide a clean and plentiful supply of potable water for our consumption. When we find out that the water we take for granted every day contains chemicals that can cause cancer, we must act without hesitation. I will fight tirelessly and work with my colleagues from both sides of the aisle to procure the necessary funding for the surveying, planning, and technology to purge our water of harmful substances and restore it to the clean and safe state we deserve. For all of the taxes we pay, we Long Islanders deserve the most basic service a government can provide: clean and safe drinking water. It’s a necessity of daily life that all New Yorkers deserve. Todd Kaminsky is the state Senator for New York’s 9th Senatorial District and was recently appointed to serve as the Ranking Member of the Senate Environmental Conservation Committee. On Twitter @ToddKaminsky. On June 13, 2014 Cuomo announced that the state Environmental Facilities Corp. would loan the state up to $511 million for the multi-billion dollar project from the Clean Water State Revolving Fund. The fund, which is actually backed by federal dollars, exists to dole out low-interest loans for projects like local sewer repairs and wastewater treatment plant upgrades. The state also has a similar Drinking Water Revolving Fund that gives out loans for water main repairs and upgrades. The move was met with immediate backlash from environmental groups that insisted the funds were simply not meant for a transportation project and that the move could set a bad precedent - perhaps undermining the very purpose for the federal funding and killing funding for clean-water infrastructure in New York and elsewhere. Budget watchdogs also attacked the plan as a “gimmick” and “irresponsible.” After much hand-wringing, it did not go forward as the Cuomo administration had sought. As the Cuomo administration struggles to divert blame for the debacle in Hoosick Falls, where the state resisted calls to notify residents of contaminated drinking water, environmentalists and others point to the Tappan Zee loan episode as evidence that the administration has repeatedly not fully recognized major clean water and water infrastructure issues facing the state, instead concentrating on costly transportation economic development projects that benefit developers while localities grapple with the costs and consequences of decaying water infrastructure. On the other hand, for some legislators and advocates say it represents the administration’s ability to recognize a problem and tackle it head on with an efficient solution. Cuomo added that he was advocating for the EPA to update its regulations to force all municipalities to conduct water safety testing (there is currently a 10,000 person population threshold). If the federal government fails to act, Cuomo said he would introduced legislation to force localities of any size to do water quality testing and that the administration would pay for the testing of localities that are strapped for cash. Environmental groups estimated at the time of the Tappan Zee loan controversy that localities across the state were contending with $36 billion in costs related to clean water infrastructure demands over the next 20 years. The federal Environmental Protection Agency (EPA), which provided the state with the billions of dollars for the fund over the last two decades, eventually rejected the proposal. But the state didn’t back down and appealed the decision. In the end a compromise allowed the state to use $1.3 million for oyster bed restoration and the replacement of a falcon box, with none of the money going toward the “New New York Bridge,” the funding of which is still not completely clear. The ordeal leant new focus to clean water infrastructure demands faced by localities across the state. (As has the recent crisis in Hoosick Falls and questions about water contamination elsewhere in the state.) While Cuomo administration officials noted that millions of dollars were sitting in the revolving fund untouched as proof that they were unneeded, local leaders countered that they simply couldn’t afford to take on anymore debt, regardless of the interest rate, because they would never be able to repay it. Meanwhile, municipalities have grappled with decaying and dilapidated water infrastructure and seen overflowing sewer lines, exploding water mains, and sinkholes. In 2015 the state Legislature pressed for a new program to help fund water infrastructure projects across the state. Cuomo signed the New York State Water Infrastructure Act to disperse $200 million in grants to localities for water infrastructure repairs and improvements. By December 2015, $75 million in grants had been awarded. 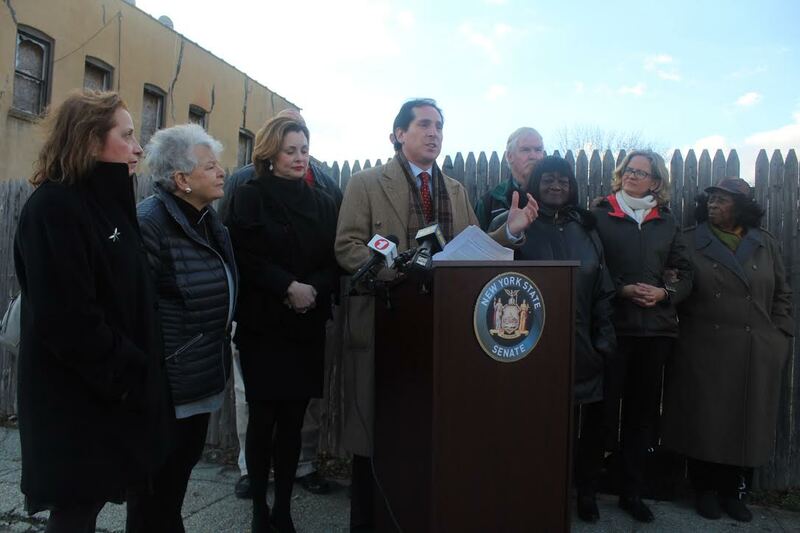 This year the state Assembly successfully fought for a $200 million increase to the program. Tierney said that the pressure on municipalities and the state to fund water projects has increased as the federal government has altered the strategy behind the Clean Water Act. Early in the 1970s when the program was starting some water infrastructure projects would receive up to 75 percent funding with municipalities covering only 12 percent. “In the olden days it was much more about funding infrastructure and regulations. Then it turned into grants and then loans and then the pot for loans began to sink.” said Tierney. He noted that the Congressional Budget Office reports that only 4 percent of water infrastructure projects are funded by the federal government. A number localities, including Syracuse, are focused on advocating for more federal funds. But in the meantime many local officials and state legislators are pleased with the administration’s efforts with the grant program. Advocates have noted a positive trend. “We have seen a total “180” on water infrastructure funding,” said Liz Moran of Environmental Advocates of New York. Moran said the Tappan Zee raid and the backlash that followed “was a wake up call” for the Cuomo administration about just how necessary water infrastructure funding is. The notion that taking on loans from the revolving fund wasn’t the ideal solution to dire infrastructure needs faced by cash-strapped localities across the state wasn’t new in 2014 or 2015. Syracuse Mayor Stephanie Miner, a Democrat like Cuomo who has clashed with the governor, has been calling for state and federal assistance in dealing with her city’s water infrastructure needs for years. In 2014 Miner called for the state to create “The Syracuse Billion,” a take off of Cuomo’s Buffalo Billion program that invested in major economic development projects. But Miner wasn’t looking for deals to draw high-tech firms to the area. Instead she proposed using $750 million of the cash to replace and repair a 550-mile, 100-year-old water pipeline that is in constant disrepair. Cuomo responded that Syracuse was going “bankrupt,” adding, "You are unsustainable. You need jobs, an economy, business. Show us how you become economically stronger and create jobs. Then you fix your own pipes." He later added he was saying the city was “metaphorically” bankrupt, according to The Post-Standard. During a 2015 budget hearing Miner pressed the State to use bank settlement funds to help struggling localities across the state. She said municipalities are handicapped by the state’s property tax cap and increasing state mandates, and can’t afford to make major infrastructure repairs without drastic intervention. Cuomo did not grant Miner’s wish, but the Assembly used discretionary funds to allocate $10 million to repair Syracuse’s water infrastructure through the 2015 budget. 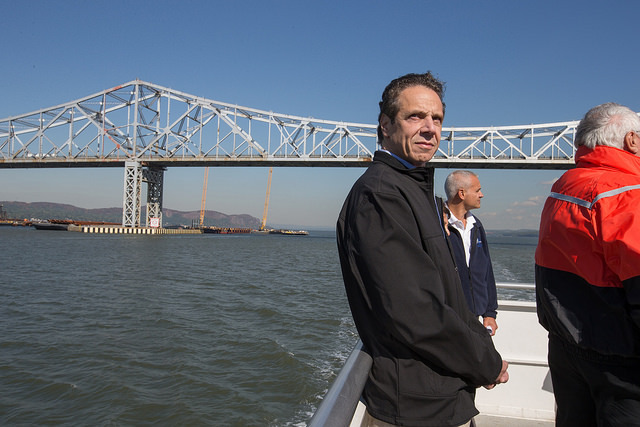 Cuomo used settlement funds for transportation projects like the Tappan Zee replacement and for economic development grants. Otis said the program was so successful and the need so great that the Legislature doubled funding for it in 2016. The first round of the program doled out $75 million in grants; the second $175 million; and the third round will come next year with the distribution of another $175 million. But Otis, as well as advocates and other government officials and workers charged with dealing with water infrastructure across the state, acknowledge the program can’t help everyone. “One or two municipalities could eat up all the funding in one shot,” Otis said, indicating the scale of the need around the state. Miner said that in her experience the Environmental Facilities Corporation (EFC) grant programs have been targeted toward smaller communities and that some of them require extensive pre-design work even to apply. Syracuse was, however, awarded $679,444 for a water infrastructure project in August through the New York State Water Infrastructure Improvement Act of 2015. Asked about the program, Miner initially responded that Syracuse was ineligible because of its large population, though the program does not have a population restriction. Miner later clarified through a spokesperson that she was talking about other grant programs offered by the EFC and that she believes the EFC needs to offer a wide array of water infrastructure grant programs for communities of all sizes. Officials from the EFC, the agency tasked with overseeing both the revolving loan programs and the water grant initiative, confirmed that there are no population restraints on the grant program. Joe Coffey, the water commissioner for the city of Albany, is all too familiar with just how costly it is to maintain an aging water system. Albany’s dates to the 19th century. The city’s water treatment plant was built in the 1930s, as was the transfer line. And as Coffey points out, age is the greatest indicator of the possibility of infrastructure failure. This summer residents have had to contend with a number of water main breaks and sinkholes that have gnarled traffic on busy roads not far from the Capitol building while the city continues to remedy sewer system overflows into the Hudson River, which functions not only as a source of recreation and food for some locals but as a water source for those down river. Albany recently won an $837,500 grant from the State. Coffey said the cash will allow Albany’s water department to leverage other funds for more projects and to expedite urgent repairs. Miner, the Syracuse mayor, echoes Coffey’s concerns about infrastructure. “I don’t want to undercut the [grant] program, but nobody wants to cut a ribbon underground--but at least people are talking about it now,” said Miner, hitting on one of the key reasons for a lack of focus on essential, basic infrastructure repairs. Miner estimates the total cost of replacing the city’s most troublesome water lines would be around $730 million. According to the Syracuse Post-Standard the city hit its 102nd water main break of this year in May--a lower total than the 171 water main breaks it had suffered by the same time last year. Miner said Syracuse is now focusing on utilizing data analysis to predict and pinpoint where fixes should be made to preempt major problems, rather than pushing for a comprehensive replacement project. She remains concerned that the state’s economic development spending may be undermined if it does not provide more assistance to localities facing dire infrastructure needs. “You can’t build a high-tech center if people can’t make coffee or flush their toilets,” said Miner.